Traditional L&D isn’t obsolete, but it is incomplete. According to a soon-to-be-released survey of nearly 800 workers, managers, and leaders we’ve just done with Harvard Business Publishing (stay tuned…), people give their employers’ learning and development opportunities an overall Net Promoter Score of -25. So we’re here to fill in the gaps by honing in on the data and insights that impact how people — and companies — learn, so you can make smarter decisions in your most valuable assets: your people’s skills. This month, we’re talking about user-generated content. 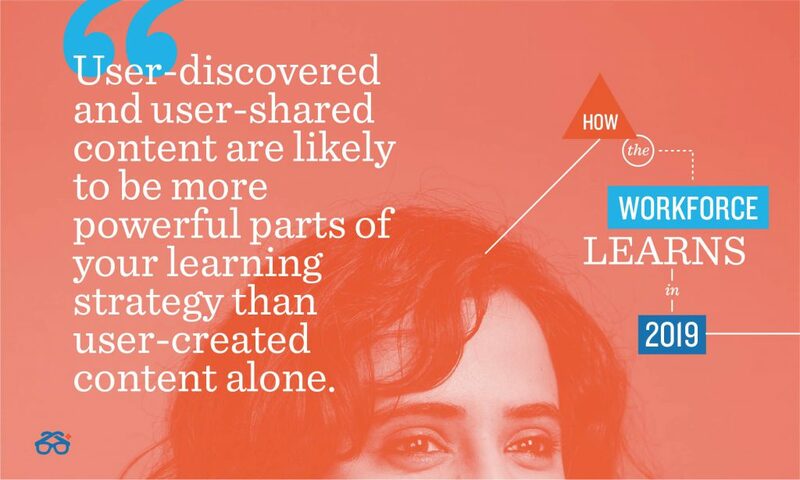 First, user-discovered and user-shared content are likely to be more powerful parts of your learning strategy than user-created content alone. And second, many learning and talent development teams could be wasting money, resources, time, and effort on the wrong solutions for encouraging peer-to-peer learning. What’s the big deal about user-generated content for learning? A few years ago, Gartner predicted that 80% of learning and development (L&D) teams would be leveraging user-generated content (UGC) by now. It makes sense. User-generated learning can be more cost-effective, faster to produce, and more relevant than building or buying. It can also be an efficient and scalable way to spread the word about new business initiatives, products, and processes, or to make sense of new opportunities, threats, and insights. It should be no surprise that UGC functionality is showing up among the requirements on a lot of requests for proposals. Problem is, there’s no data out there on how the workforce actually generates learning to inform those requirements. Most L&D teams are just assuming that because a lot of people create videos for YouTube or Instagram, that everyone wants to do it for work, too. Assuming rarely goes well. So we conducted a little of our own research and generated some insight into who’s generating what. 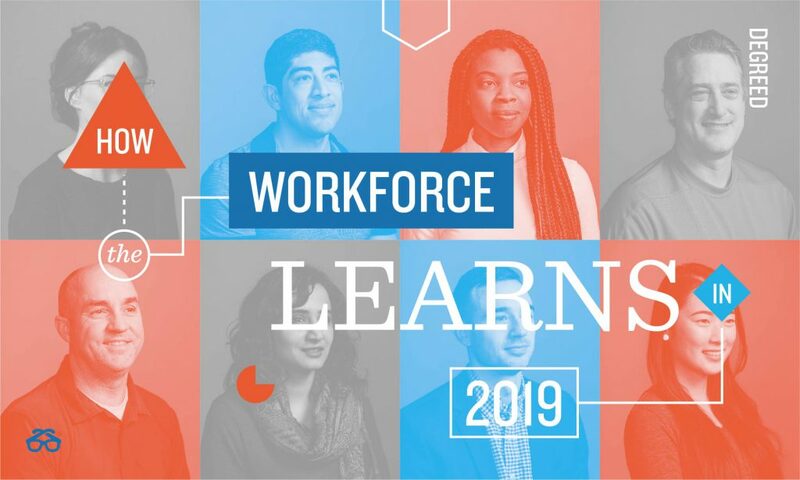 In January, Degreed surveyed 213 North American workers via Google Surveys about what they do to share their knowledge or skills with their peers. Around 42% of those people are individual contributors, 16% manage a team, 14% lead a function or business unit, and 17% said they’re executives. The other 11% identified as gig workers — consultants, freelancers, contractors, or temporary workers. Nearly four in ten people (39%) we surveyed said they had responded to questions in online messaging, collaboration, or enterprise social network tools. 37% shared articles, blog posts, videos, or podcasts from the Internet last year. And 34% created documents, articles, or presentations. Fewer than 10%, however, live streamed a video (8.5%), shot a Snapchat or Instagram-style “selfie” video (7.5%), or captured a webcast or screencast (6.1%). Simply put, it’s rare for workers to generate learning content. 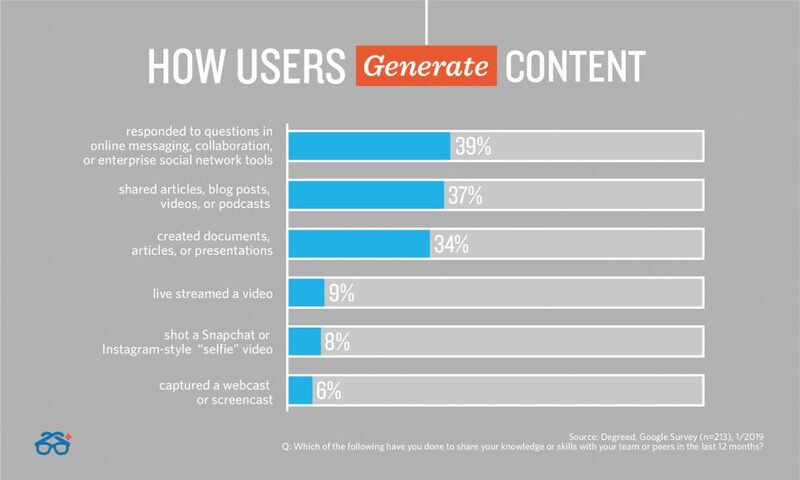 Among those who do, user-shared and user-discovered content is much more common than user-created. Moreover, text-based content is significantly more common than video — even among Millennials and Generation Z. Yes, younger workers — 18 to 44 years old — are a little more likely to create videos than older ones — those 45 or older. But the general pattern remains true across all age ranges as well as career stages. Take Google: the home of YouTube, which is ground zero for user-generated content. The number of Google employees volunteering to teach their peers through the company’s Googler-to-Googler program tripled from 2,000 to 6,000 in the last five years. Those people account for a big portion of the learning activity the company tracks. But that still means only 6.7% of Google’s full-time employees are creating learning — just 3.5% if you include the temps, vendors, and contractors who make up nearly half the company’s total workforce. The most mature L&D teams — those who are most responsive to shifting business needs, most productive, and most effective at driving revenue growth through learning — are three-times more likely to enable UGC, according to Towards Maturity’s research. What often gets forgotten in all the excitement about user-generated content, though, is how the workforce actually creates and shares it. People want to share what they know, and the smartest L&D teams are generating real value tapping into that expertise. Yet too many are building their requirements around misguided assumptions. 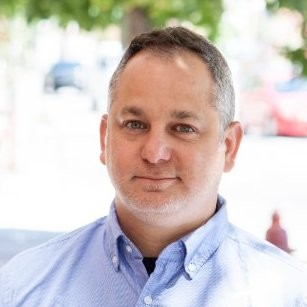 If you don’t understand how your workforce really generates learning, you could be prioritizing the wrong features, or worse, wasting money on the wrong solutions entirely. More so, the knowledge and expertise that’s not being shared among team members and your business is a huge swing and miss. Next week, Degreed kicks off an international roadshow that can help your experts generate learning and share their skills. Join us in over 20 cities around the world.